According to internal metrics, only one in five players will make it to Absolution's credits. Developer IO Interactive is using a lot of metrics while working on Hitman: Absolution, and the results aren't always pretty. According to game director Tore Blystad, the unwillingness of gamers to commit to one title for a long period of time means "the general player will probably never even finish the game." Though he feels that Absolution offers plenty of compelling content, IO's data shows that only 20% of players will make it to the last level, which "makes the people working on it really, really sad." Blystad went on to explain the development challenge of getting gamers to keep playing, such as giving them things to find and reasons to explore each level. In user tests, players have responded well to the IO's efforts to increase the "replayability factor," though it's unclear how these tests will affect its estimate that only a fifth of players will see the end of Absolution. Pushing some of the more interesting content to an earlier point in the game, where more gamers were likely to experience it, was also considered, but Blystad stated that Absolution's story structure would make that too difficult. "I think in some of the previous Hitman games that that might have been the case - that some levels were moved earlier, because they were more catchy or interesting," he said. "For us it hasn't really been that easy, because the story is really tying all the levels together, so they're still coming in the same order, more or less, that they were designed." It's easy to imagine why developers would be upset about their hard work never being played, though Blystad's description of the "really, really sad" development team is kind of depressing. 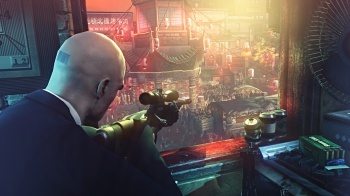 IO's estimate that only a fifth of people who play Hitman: Absolution will complete it is a little disheartening, and it will be interesting to see whether that holds true when the game comes out later this year.